[S6] Cokayne, and others, The Complete Peerage, volume XI, page 635. After her marriage, Lady Henrietta Stuart was styled as Countess of Huntly on 21 July 1588. 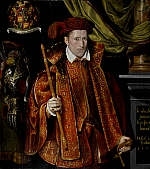 From 21 July 1588, her married name became Gordon. After her marriage, Lady Henrietta Stuart was styled as Marchioness of Huntly on 17 April 1599. [S6] G.E. Cokayne; with Vicary Gibbs, H.A. Doubleday, Geoffrey H. White, Duncan Warrand and Lord Howard de Walden, editors, The Complete Peerage of England, Scotland, Ireland, Great Britain and the United Kingdom, Extant, Extinct or Dormant, new ed., 13 volumes in 14 (1910-1959; reprint in 6 volumes, Gloucester, U.K.: Alan Sutton Publishing, 2000), volume IV, page 438. Hereinafter cited as The Complete Peerage. From 16 August 1630, her married name became Douglas. She was also known as Catherine Clifton.2 She succeeded as the 2nd Baroness Clifton, of Leighton Bromswold [E., 1608] in October 1618.6 After her marriage, Katherine Clifton, Baroness Clifton (of Leighton Bromswold) was styled as Countess of March on 7 June 1619.3 After her marriage, Katherine Clifton, Baroness Clifton (of Leighton Bromswold) was styled as Duchess of Lennox on 16 February 1623/24. After her marriage, Katherine Clifton, Baroness Clifton (of Leighton Bromswold) was styled as Dowager Duchess of Lennox on 30 July 1624.2 On 28 November 1632 she obtained a Royal Licence to retain her rank as Duchess of Lennox.7 Her last will was dated 12 August 1637. [S6] Cokayne, and others, The Complete Peerage, volume VII, page 608. [S6] Cokayne, and others, The Complete Peerage, volume III, page 310. She was also known as Jean Charteris. From 26 April 1649, her married name became Douglas. From 11 August 1659, her married name became Gordon. 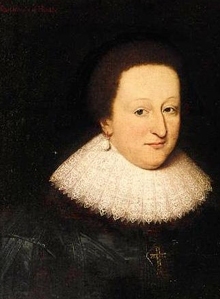 David Wemyss, 2nd Earl of Wemyss was born on 6 September 1610. He was the son of John Wemyss, 1st Earl of Wemyss and Jane Gray. He married, firstly, Hon. Anna Balfour, daughter of Robert Balfour, Lord Balfour of Burleigh and Margaret Balfour, Baroness Balfour of Burleigh, on 4 February 1627. He married, secondly, Lady Eleanor Fleming, daughter of John Fleming, 2nd Earl of Wigton and Margaret Livingstone, on 4 April 1650. 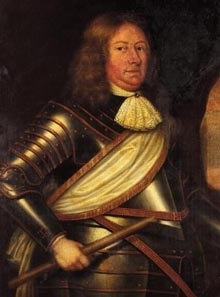 He married, thirdly, Lady Margaret Leslie, daughter of John Leslie, 6th Earl of Rothes and Lady Anne Erskine, on 13 January 1653 at Sheriffhall, ScotlandG.3 He died in July 1679 at age 68. [S6] Cokayne, and others, The Complete Peerage, volume II, page 365. [S6] Cokayne, and others, The Complete Peerage, volume II, page 438. Hon. Anna Balfour was the daughter of Robert Balfour, Lord Balfour of Burleigh and Margaret Balfour, Baroness Balfour of Burleigh.2,1 She married David Wemyss, 2nd Earl of Wemyss, son of John Wemyss, 1st Earl of Wemyss and Jane Gray, on 4 February 1627. She died on 10 November 1649.